Cables used to create a home computer network. These cables can work at up to 1000Mbps at 100MHz and can also carry telephone and video signals. These work fine for standard applications, but consider that as internet speeds continue to rise, they may no longer be fast enough. 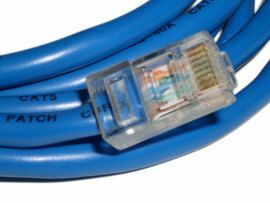 Cat 5e cables offer some cost savings over the newer Cat 6, but spending a little more now could avoid the need to have the cables replaced when they are no longer fast enough. Cat 5e cable costs about $0.20 to $0.30 per linear foot.